Alexandra will visit you and your horse at your stable or yard. 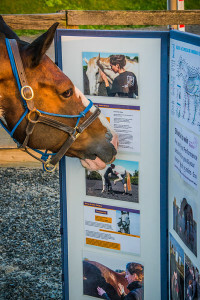 She will assess your horse and take a case history, which will include questions about physical conditions, attitude to work, emotional outlook and social position in the herd. Next, she will observe your horse, possibly on the lunge and if appropriate under saddle. A session normally lasts an hour and a half. It is preferable to find a quiet area to treat your horse. To maximize the integration of the Shiatsu, your horse would benefit from being allowed a day off work. After the session Alexandra will explain and show you techniques which will then allow you to treat your horse until her next visit. She may include her experience of ground – and awareness exercises based on the methods of Linda Tellington-Jones and work at liberty in a picadero. Gain the greatest benefit by applying the four building blocks of Alexandra’s work: treating the horse, treating the rider and teaching the rider to apply safe techniques specific to both their horse and themselves. Plus Qi Gong body awareness and fitness exercises. By having Shiatsu yourself you learn about and even out your own imbalances. Over time, your body builds up an internal knowledge of what it feels like to receive Shiatsu. Back up this knowledge with individual tuition, focusing on your unique physical patterns as a rider. Over time, this will guide you to know how and where to apply holding, pressure and therapeutic techniques to your horse.